Jessica Mitford, known in the family as Decca, was one of the six daughters born to English aristocrats David Freeman-Mitford, 2nd Baron Redesdale, and his wife Sydney. She received little formal education but was widely read. At age 19, she eloped with her second cousin Esmond Romilly and went first to Spain, where Romilly worked as a war correspondent after having fought in the Spanish Civil War. The couple then lived in the East End of London before leaving England for the USA. At the start of World War II, Romilly enlisted in the Royal Canadian Air Force; he was killed a few months after Jessica gave birth to their daughter. She remarried in 1943 to Robert Treuhaft, a civil rights lawyer, and moved with him to Oakland, California, and had two sons. Jessica was active in many civil rights causes and left-wing politics. She became an investigative writer and journalist, and published her bestselling exposé of the funeral industry, The American Way of Death, in 1963. She also wrote several memoirs, including Hons and Rebels (1960, also known as Daughters and Rebels). Jessica's deeply held beliefs caused her estrangement from her sister Diana, Lady Mosley. Jessica Mitford is currently considered a "single author." If one or more works are by a distinct, homonymous authors, go ahead and split the author. 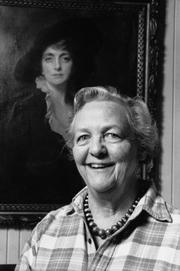 Jessica Mitford is composed of 9 names. You can examine and separate out names.